I love both the color and the visuals of ferns and although I haven't used them in decorating my home, I have used them in other projects. Here are the assorted stationery components for our daughter Karen and Jared's wedding back in 2007. Yes, it is old news but I wasn't blogging back then and I don't expect to be doing anymore weddings! Karen wanted handmade invitations and I put together a variety of ideas. The one that was chosen was the fern theme. I'd found several beautiful papers, one in sage green with a silken thread woven into it and another a soft fern print. 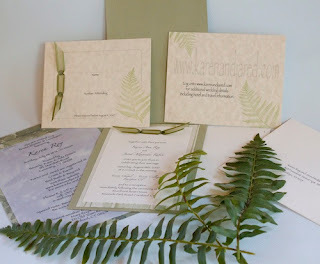 I combined that with a fern stamp, sage green ink, parchment paper, and matching ribbon to create the various designs for wedding stationery. Using the computer and carefully chosen fonts along with layering, stamping and simple ribbon inserts all the various pieces were assembled. The most challenging part was getting just the right amount of ink on the fern stamp to create a soft subtle fern. We didn't over do the theme although it did carry through to fern and candle centerpieces and massive ferns around the chuppah at the ceremony. It was understated yet pretty and it was created by Mom with love!